Construction teams are usually complex, interdisciplinary and temporary, and, as such, the need for effective communication is crucial. However, published data regarding the manner in which individuals interact within the temporary project team is scarce, with little other than anecdotal evidence available. 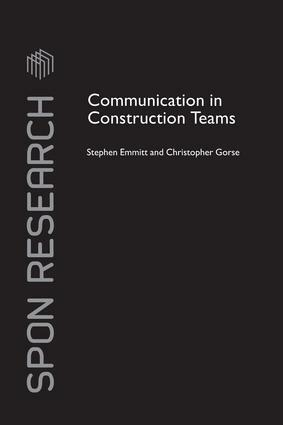 Recognizing this gap, Communication in Construction Teams provides a comprehensive overview of the literature on interpersonal communication and delivers a critical review of various research methods previously used in and outside the construction management field. Making use of Bales' interaction process analysis (IPA), a tool used successfully in many fields to collect interaction data, the text investigates the link between successful projects and the effectiveness of communication, finding that participants in the construction process exhibit regular patterns of interaction and, most significantly, that there are different patterns of interaction associated with successful and unsuccessful projects. Putting forward a number of practical suggestions to assist all actors involved in construction projects, this insightful publication will be of interest to researchers in the fields of building design and construction management. Professor Stephen Emmitt BA(Hons), Dip. Arch., MA Prof. Ed., PhD is the Hoffmann Professor of Innovation and Management in Building at the Technical University of Denmark. He is a registered architect with industrial and research experience. He holds a PhD from the University of Manchester and has published widely in the field of design and construction project management. Dr Christopher Gorse BSc(Hons), Dip. Ed., Dip (H&S), MSc., PhD., MCIOB, MAPM is a Senior Lecturer in Construction Project Management at Leeds Metropolitan University. He is a construction and project management consultant with industrial and research experience. He holds a PhD from the University of Leicester and has published widely in the field of construction project management.